It is the mission of Special Collections/University Archives to acquire, preserve, and provide access to primary resources and rare and unique materials that support Bucknell University's academic mission and meet the teaching, learning, and research needs of students, faculty, and staff. Special Collections/University Archives is responsible for collecting, preserving, and providing access to three distinct collections: special collections in the form of rare books and manuscript collections, and the university archives collection which is comprised of the historical records of Bucknell University. 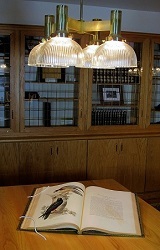 Collecting practices are guided by the Special Collections/University Archives collection development policy. Local and regional historical resources as well as genealogical resources are not within the collecting scope of Special Collections/University Archives. Please contact your local historical societies and repositories for assistance.